The Cernuschi Museum re-opened its doors in June, 2005, after undergoing a more than 3 year renovation at the cost of 7 million euros. 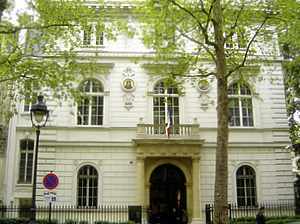 The Musée Cernuschi is the second most important collection of Far Eastern art in Paris, after the Guimet Museum. It houses the fifth largest collection of Chinese art in Europe. The renovation created more exhibition space and improved the lighting while retaining the original oak parquet floors, the original staircase and the decorative ceiling moldings. Cernuschi's smoking room has been designed as a memorial to him. Of the 12,400 objects in the Museum collection, 900 are on permanent display. The main body of this collection are Chinese bronzes from the 15th century B.C.-3rd century A.D. The Musée Cernuschi is most noted for its Chinese art which ranges from the Neolithic age to the 13th century. 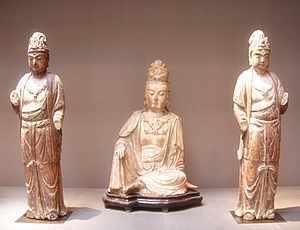 Included are Han dynasty tomb figures, called mingqi, from 206-209 B.C., and from 386-354 B.C. of the Northern Wei dynasty and the Sui dynasty, 821-618 B.C. The Tang and Song dynasties are represented with pottery and a rare collection of gilded bronze objects represent the Liao dynasty, 907-1125 B.C. Of exceptional note in the Museum collection is an 11th century B.C. bronze wine vessel known as, "The Tigress", and the bronze Jian basin, the largest outside of China. Also from the 8th century Tang dynasty are the polychrome terracotta figures of female musicians on horseback. A collection of restored Chinese calligraphy is also exhibited. The Japanese collection comprises over 3,500 objects of bronze and ceramic and paintings. The Cernuschi Museum collection of "mingqi" is quite impressive. Mangqi were intended to provide earthly comforts and were entombed with the corpse. They are in the representation of musicians and dancers, cooks and guardians and birds and horses. These and the bas-relief sculptures from the walls of tombs offer a look into Chinese life of 2,000 years ago. Enrico Cernuschi (1821-1896) was a financier and philanthropist from Milan. He fought in 1848 to liberate Milan from Austrian rule and then served on the Roman National Assembly for one year. When the new government collapsed in 1850 he escaped to France where he became wealthy working in commerce and banking. He aided in founding the Banque de Paris, changed his name to Henri and became a French citizen in 1870. In 1871, he was arrested and released for being a prominent sympathizer of the Communards. After witnessing the bloody uprising, he traveled to the Orient in September, 1871. He began to collect Oriental art, buying in mass quantities. Upon returning to Paris eighteen months later, he built a mansion near Parc Monceau for himself and to house his collection of nearly 5,000 works of art, including a bronze Japanese Buddha sculpture that was so large, the largest in Western Europe, that the house was basically designed around it. 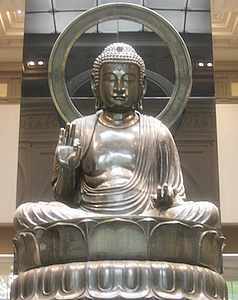 It is the 18th century Amida Buddha. It was necessary to cut the 4.4 meters high sculpture into several pieces for its transport to Paris from Tokyo. Upon his death, Cernuschi had the house and the art collection, which he continued to add to throughout his life, bequeathed to the city of Paris. It was inaugurated as a public museum on October 26, 1898. The Museum is open Tuesday-Sunday from 10:00 a.m.-5:45 p.m. It is closed on Monday and public holidays. Here is a page for other Free Museums in Paris. For further information, here is the Museum Website.